High wicking 300g polyester fleece with wide binding, piped edges, cross surcingles & single chest closure. Classic European cut & rich jersey brushed polyester fabric, hidden belly surcingle & corded tail strap. 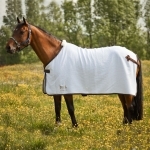 The Amigo® Mio Fleece Cooler is a great value in a light weight anti-pill cooler. 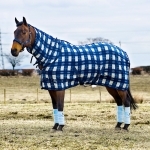 Lightweight anti-pill fleece with cross surcingles, classic original cut & corded tail strap. Amigo Net Cooler with textured net material, with removable cross surcingles & handy storage bag. 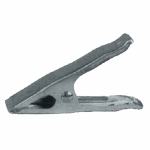 This skrim is made of a soft fabric - not scratchy or rough feeling. Classic european cut. Comes in sizes 30" for Mini&apos;s to 98" for Drafts. 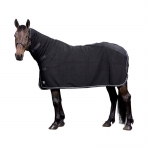 Mesh summer sheet features a tight yet breathable weave keeping bothersome insects off your horse. 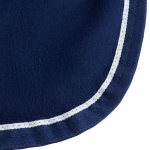 Anti-bacterial quality will help reduce the possibility of skin disease, lightweight & soft 4 way stretch. 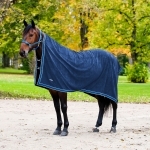 "Spasoft" is a soft, high performance fabric with a total sun block capability, horse or pony size. A high performance cooler using natural Jade, moisture wicking & breathable, machine wash & dry. The first "drug-free", lightweight, breathable therapeutic Full Body Cooler using Liquid Titanium fabric. 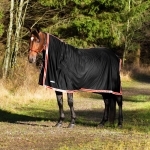 Anti-piling fleece cooler, perfect for prize cooler use or even when drying the horse after training and washing. 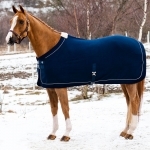 Stylish Royal Equus show rug in heavy quality fleece. Pile fleece at the wither, two front buckles and one surcingle. Grey cord along the binding. 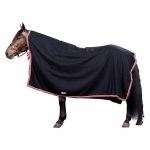 High wicking polyester fleece including a neck piece to keep your horse's neck warm & dry. Lightweight polyester cooler with straight front closure, hidden belly surcingle & corded tail strap, storage bag. 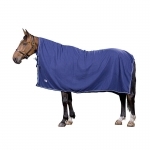 Makes a super under-blanket with detachable surcingles, double front closure and fillet string at the rear. Classic european cut. Hidden belly surcingle and corded tail strap.